A Treasury of American Horror Stories by Frank D. McSherry Jr.
We’d love your help. Let us know what’s wrong with this preview of A Treasury of American Horror Stories by Frank D. McSherry Jr.. Preview — A Treasury of American Horror Stories by Frank D. McSherry Jr.
To ask other readers questions about A Treasury of American Horror Stories, please sign up. I picked up this book in probably 1991 on the discount shelf at a local bookstore. It is easily my favorite collection of horror stories, and I have either lent it or recommended it to nearly everyone I know who enjoys the horror genre. But I love this book so much I always make sure I get it back when I lend it out! There is one story for each state in the U.S. and something from 50 different authors including H.P. Lovecraft, Edgar Allan Poe, Mark Twain, Richard Matheson and Stephen King, off t I picked up this book in probably 1991 on the discount shelf at a local bookstore. It is easily my favorite collection of horror stories, and I have either lent it or recommended it to nearly everyone I know who enjoys the horror genre. But I love this book so much I always make sure I get it back when I lend it out! Originally, when I had set down to transcribe my new year's resolutions from thought to paper; I had no intention of including this book in my 2005 reading list. Not because it is a "bad" or poorly written book or even the fact that it was published when I was only six years old. No, the primary reason was that I had read this book in spurts about a dozen times between 1988 and 1992, as it was the first "grown-up" book I had ever purchased and taken an interest in. It was only while sifting throu Originally, when I had set down to transcribe my new year's resolutions from thought to paper; I had no intention of including this book in my 2005 reading list. Not because it is a "bad" or poorly written book or even the fact that it was published when I was only six years old. No, the primary reason was that I had read this book in spurts about a dozen times between 1988 and 1992, as it was the first "grown-up" book I had ever purchased and taken an interest in. It was only while sifting through some items we have boxed up in storage, while my wife and I wait for our house to be built, that I stumbled across this long forgotten text. 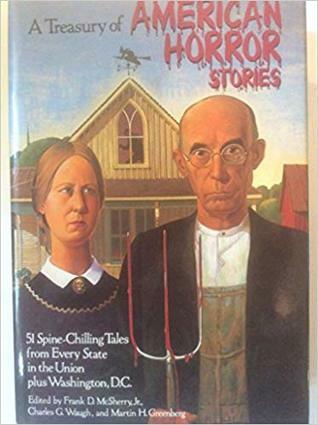 The cover alone, a take on the "American Gothic" painting was enough to send chills up my spine when I first read this book, a time when I still had the pleasure of attending recess daily and drinking chocolate milk straight out of a half-pint cardboard container. I haven't read all the stories yet, but my favorite so far is Twila. So freaky! One of my favorite collection of horror stories of all time. The United States is quite a scary place to live; at least that’s what the authors of A Treasury of American Horror Stories are trying to portray. This book incorporate 51 stories, one from every state in the Union including Washington D.C. It is quite interesting though, as each individual story is written by a different author. That is one of the many things that I particularly enjoyed about this short story compilation. Every story gave you a new writing style and was not the same throughout the whole book as each and every author has their own way of writing. I would say one of the better authors in the book was Michael Shea, an American fantasy, horror, and science fiction author who has won three awards for his short story, The Autopsy, which just so happens to be the short story incorporated into this book. This short story in particular was my favorite as it had a very eerie feel tone to it that I did not get from the other short stories. As far as the other stories in the book go, I would say that they serve justice to the title American HORROR stories. Each one is different in the horror that they portray through words. For instance, Being, by Richard Matheson, wrote about the death of a millionaire tv star who tricked people into believing supernatural occurrences and one night when he was on-air, the people believed so hard what he was saying that an actual being with a clam’s face came out of a swamp and ate the man. Another, Cannibalism in the Cars, by Mark Twain looks at two men sitting at a train station, one of them telling a story about how all these men were going to a conference and got stuck in a snowstorm that left them stranded on the train and eventually they created a democracy where all would vote on who would be eaten for breakfast and dinner. However, at the end of the story, it turns out that the man just has a mental illness and makes up stories. A Treasury of American Horror StoriesEach story is different in their own way and if you enjoy scary, goofy stories, this book is definitely one that you should add to your reading list! This story collection is definitely a mixed bag of horror stories from both the greats and the fairly unknowns with each story connected to one of the 50 states (plus D.C.). Before I get into those tales that stuck with me long after I finished them, I want to note two problems with the first edition copy I own. 1) This book is RIDDLED with typos. My father made some attempts to correct the obvious ones but they are overwhelmingly distracting in their quantity and varied appearance. 2) The paper This story collection is definitely a mixed bag of horror stories from both the greats and the fairly unknowns with each story connected to one of the 50 states (plus D.C.). Before I get into those tales that stuck with me long after I finished them, I want to note two problems with the first edition copy I own. 1) This book is RIDDLED with typos. My father made some attempts to correct the obvious ones but they are overwhelmingly distracting in their quantity and varied appearance. 2) The paper chosen for this book is cheap, browned quickly, and has a strong odor. Don't get me wrong, I usually enjoy "old book smell" but cracking this one opens a rush of odor without having to get anywhere near the spine. That noted, the following stories stuck with me. "Seventh Sister" by Mary Elizabeth Counselman. This is a wildly uneven collection. It ranges from the excellent (Pickman's Model by HP Lovecraft, Children of the Corn by Stephen King) to the mediocre, to the "Why is this @#^& story even here?? It's awful!". Not to mention that the "Georgia" story would be good if it wasn't so incredibly racist. Yes, yes, it was published in 1943, but the anthology was put together in the '80's, so there is NO EXCUSE for using the word "pickaninny" to describe anyone with a straight face. Since I bought t This is a wildly uneven collection. It ranges from the excellent (Pickman's Model by HP Lovecraft, Children of the Corn by Stephen King) to the mediocre, to the "Why is this @#^& story even here?? It's awful!". Not to mention that the "Georgia" story would be good if it wasn't so incredibly racist. Yes, yes, it was published in 1943, but the anthology was put together in the '80's, so there is NO EXCUSE for using the word "pickaninny" to describe anyone with a straight face. About Frank D. McSherry Jr.
Books by Frank D. McSherry Jr.